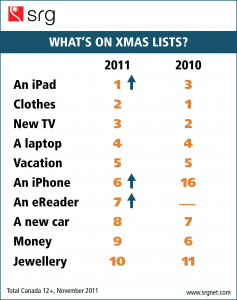 Apple’s iPad is the most-desired item on holiday season wish lists this season according to SRG’s recent research. Rounding out the top 5 are clothes, a new TV, a laptop and a vacation. Tablets were by far the top growth category between 2011 and 2010, almost doubling in mentions (+80% growth). iPad mentions accounted for 83% of all tablet mentions, landing the brand in the #1 spot. Mobile phones were also a growth category, increasing +23% year-over-year in mentions. Smartphones accounted for three-in-four mentions in the mobile phone category. Apple’s iPhone had the most mentions by a significant margin over Android and BlackBerry and ended up in the #6 spot on its own. As tablets, mobile phones and eReaders boom, some related consumer electronics categories declined somewhat in terms of mentions from last year. Clearly, the consumer has only so much money to spread around all these devices. iPod and MP3 player mentions declined by 21%. New TV mentions declined by 19% (now ranked #3 vs #2 last year). Laptops and desktop PCs combined declined by 11% in mentions. There were slight declines in total mentions of video game consoles and Blu-Ray players as well. Other notable digital items were GPS devices, Mac computers, digital cameras and video games; while not in the top 10, these products will also do well this Xmas season. Overall, SRG found a cautious consumer sentiment leading up to the end of the year. Fifteen percent (15%) of Canadians said they will spend more this year on holiday shopping but 32% said they will spend less and 53% said they will spend about the same. Technical: The results are based on a survey of 1,000 Canadian consumers conducted during the first week of November 2011.